Supporters of the gallery, which faces closure due to funding cuts, have set up their own pages on the social networking sites Facebook and Flickr to help their campaign. You can help the campaign by becoming a member of the "Save the William Morris Gallery" group on Facebook, and related images can be posted or viewed on Flickr at www.flickr.com/groups/keepourmuseumsopen. 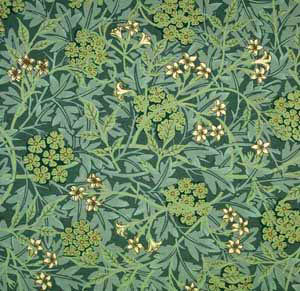 Shown here: Morris & Company "Jasmine" wallpaper (1872); designed by William Morris; block-printed in distemper colors.